Learning system upgrades lead to increased learning happiness! We are pleased to announce that the University of California is updating our Learning Management System, also referred to as the UC Learning Center. The UC Learning Center is a resource for all staff and faculty at UC Santa Cruz and provides access to required training and additional online and in-person activities for professional development. Beginning February 4th, you will see changes when you log in to the UC Learning Center. The home page features a more modern look, greatly improved internet browser compatibility, and additional features which will be announced in future communications. Your current registrations and completed activities will not be impacted by this change. The system will be unavailable beginning today, January 29, 2015 at 5:00 p.m. (PST) until this coming Wednesday, February 4. Any in-person training scheduled during this time will take place as planned. 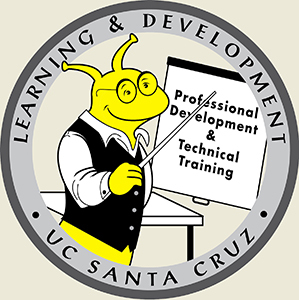 If you have questions about the changes, please contact Training and Development, at learningcenter@ucsc.edu.